It has been a whirlwind couple of days. 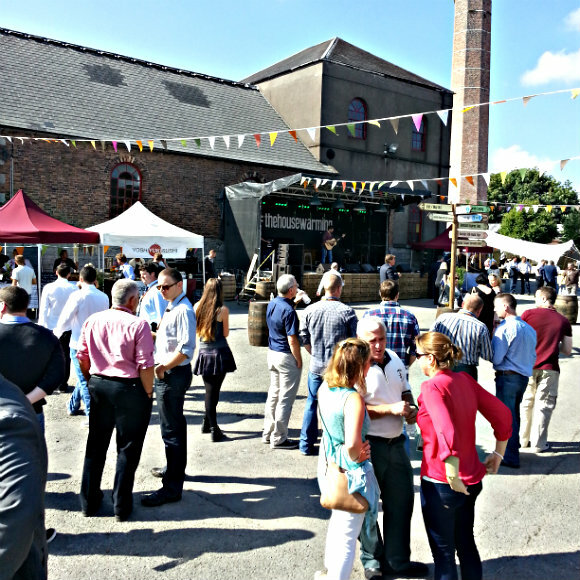 I was lucky enough to be invited to Midleton Distillery to see the opening of a new stillhouse, the establishing of an Irish Whiskey academy and overall expansion of grain distillation and warehousing. Hence why they called it a housewarming, although I suppose in a way it was more like adding a new wing to a long built house, rather than a whole new house (I could get too fixated on this metaphor, so we will just move on). To give you an idea, they are doubling the production on the Midleton site, from roughly 34 million litres, to over 60 million litres. 20 million litres of that will be pure pot still whiskey, which is pretty mind boggling when you consider that the biggest single malt distilleries in Scotland are roughly half that size. Although, that is perhaps a misleading idea, since Midleton not only supplies all the whiskey for Green Spot, Yellow Spot, Paddy, Powers, Redbreast, but it also provides all the pure pot still whiskey for Jameson itself. Another way to think about it would be that it would be like Grant’s blend, or Bell’s, getting all their whisky from one site. Or a different example; Johnnie Walker has at least 28 single malt distilleries and several grain distilleries to choose from, whereas Jameson make all their different styles (light pot, med pot, heavy pot, light grain, numerous more versions) under one roof. 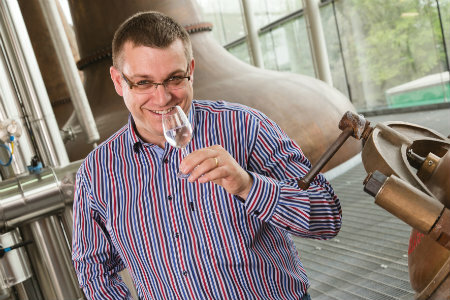 So with huge growth figures in America, and very strong figures across the board, Irish Distillers have invested to try to avoid a shortfall in product. They will be betting that demand continues to grow, and that this new facility can meet that demand. The expansion of the Midleton site, marks the end of a chapter in Jameson and Irish Distillers’ history. It coincides with the retirement of Barry Crockett, the Master Distiller of Jameson, whose tenure, which has spanned from 1981, is coming to a close. He is passing the mantle on to his apprentice of 10 years, Brian Nation, who is getting this giant new facility to play with. Barry’s legacy will take some matching, but I suspect Brian will be up to the task. Brian conducted a tasting of Redbreast, Green Spot, Powers John Lane and Midleton Rare when we arrived at the housewarming party (more about the party later). He spoke at length about the excitement of getting this new distillery to play with, but also of the dedication he had to apply when getting to grips with the new stills. With new copper, new equipment and new technology, it has taken a bit of time for him to get the new spirit to a quality level that he’s happy with, and replicates the quality that the previous distillery produced. I’m sure Barry was around to pass on his wealth of advice to make sure the transition in terms of new distillery and new master distiller, was a seamless one. After the tasting, we went to check out the Irish Whiskey Academy. 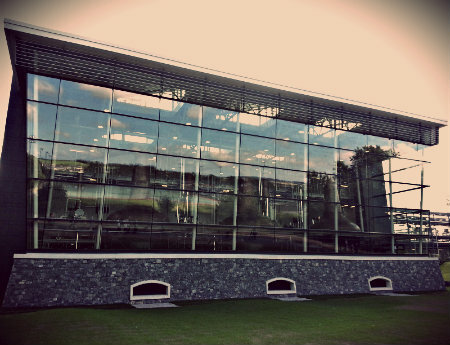 This is their new, onsite education centre, for teaching Jameson brand ambassadors, media folks and the enthusiastic general public about how they do things at the Midleton Distillery. I think this is a great thing, as it really uses the distillery site to its full potential. Not only is it a place to make whiskey, but also a place to educate and impassion. They had all sorts of useful educational tools at the academy, including glass pot stills (to play about with) and more cask samples than you can drink in one go (I can hear my co-blogger Jason somewhere saying “challenge accepted!”). It will be somewhere that members of the public can visit, and spend a few days going through training courses on Irish Whiskey. Once we find out prices, we will let you know. To give you an idea, there is a big square in the middle of the Midleton Distillery. For the housewarming day party, they had built a stage for bands, set up a market with all sorts of different food/drinks stalls, and they had all sorts of guest speakers doing presentations at different venues on each side of the square. It made for an amazing, almost festival like atmosphere and really made it feel like a housewarming party. This is where I will leave this blog post. The next part of my Ireland trip will include tasting notes to all the drams I tried, and a bit about some of the amazing musicians that we saw. And they say it’s a hard life being a blogger. This entry was posted	on Thursday, September 5th, 2013 at 6:17 pm	and is filed under Featured. You can follow any responses to this entry through the RSS 2.0 feed. Responses are currently closed, but you can trackback from your own site.